I used to be really diligent about taking a multivitamin. Someone—either a family member, an editor, or a doctor (my trusty sources)—advised that I start taking one regularly for optimal health, and I obliged. Once the bottle ran out, however, so did my commitment to a daily supplement. My healthy stint was short-lived and so continued my overly processed and sodium-filled diet. That is, until I was introduced to the world of Olly Gummy Vitamins ($14). "Gummy vitamins" always seemed like an oxymoron to me, like a supplement had to taste medicinal and bitter in order to work. Truth is, though, that I've come to swear by them; I keep about seven bottles in my desk drawer (of varying kinds, like Beauty for longer hair and stronger nails, Goodbye Stress when I'm feeling overwhelmed, and Daily Energy when I need a boost.) What I've honestly found has been that each one of them actually does what it claims to do—my hair has grown faster, my mind is eased, and my afternoon slumps are reversed. I get that there's the potential to feel a placebo effect, or "wanting" them to work so badly that they do, but hand to God, I think they're amazing. To find out a little bit more about their efficacy, we spoke with some dermatologists for their thoughts on the ingredients inside the Beauty and Vibrant Skin vitamins, specifically. Mara Weinstein, MD, FAAD, of Schweiger Dermatology Group was, surprisingly, skeptical: "There are no controlled clinical studies on or published data that confirm the efficacy of these supplements. There is also no evidence that what is ingested systemically actually reaches the skin." Elizabeth Tanzi, MD, founder of Capital Laser and Skin Care has similar sentiments: "They certainly won't hurt you, but the science as to whether they will actually help is not strong." While there may limited studies to back up ingesting ingredients like biotin and hyaluronic acid, all of Olly's gummies are formulated with the help of experts like Taryn Forrelli, ND, Alexia Lundberg, PhD (nutrition and biochemistry), and David Chernoff, MD, who help cherry-pick the ingredients in each chewable to help improve various areas of the body. But this is just two of the formulas—for example, the Sleep gummy is fortified with melatonin, which is clinically proven to help you fall and stay asleep (they knocked my mom and my co-worker right out); the Purely Probiotic supplements are chock-full of one billion CFUs (good bacteria); and the Vitamin D3, Omega-3, and Multivitamin all boast healthy doses of their respective nutrients. So while I can't technically scientifically prove my longer hair and smooth skin, I know for a fact that several of Olly's other gummies are hard at work improving my body from the inside-out. To further prove their allure, a lot of celebrities love these gummies just as much as I do: Jennifer Lopez, Olivia Culpo, celebrity makeup artist Mary Phillips, Hannah Bronfman, and celebrity hairstylist Justine Marjan, to name a few. They constantly tout the colorful vitamins on their Instagrams and Snapchats, raving about the results they've been able to achieve with them. 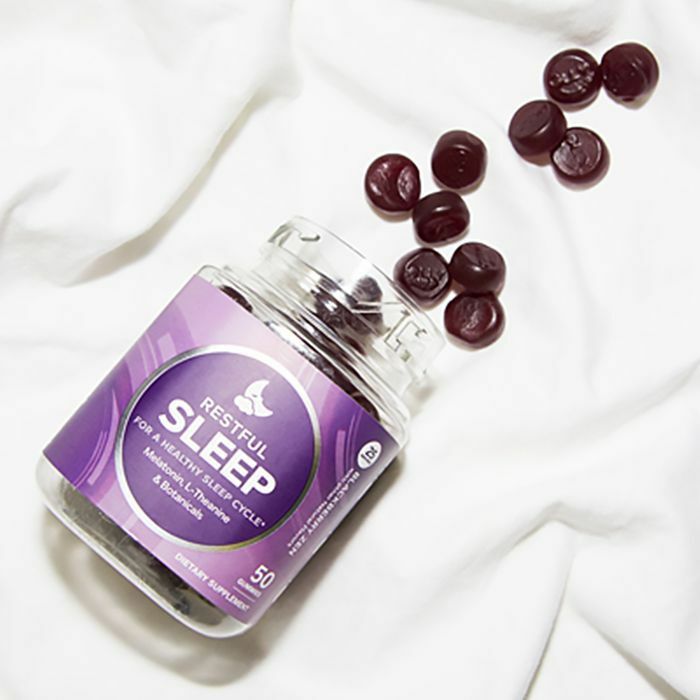 It girl Olivia Culpo recently shared her love of the Sleep gummies on her Snapchat, saying she takes them "every night." Culpo's hairstylist, Justine Marjan (who also styles the likes of Khloé Kardashian and Chrissy Teigen) swears by Olly products to get her through her hectic schedule: "As a freelance hairstylist, no two days are ever the same, so staying in a healthy routine is hard. I have no consistency, which is why Olly smoothies and gummies make it easy for me to maintain a healthy lifestyle. I keep a few smoothie pouches in my kit for when I'm rushed between clients or on set with no healthy options, and I love having an array of OLLY gummies to keep me healthy and balanced. On busy days, I love the Energy gummies as an alternative to coffee and the Sleep gummies before bed to ensure a good night's rest. I also pop the Undeniable Beauty, Vibrant Skin, and Woman's Multivitamins daily. It makes me feel like I'm having something sweet without the guilt of candy and I know I'm getting all the nutrients I need to keep me clear, focused, and healthy." Phillips loves Olly gummies not only for how they work but for their pretty aesthetic, too: "The beauty industry is inundated with so many topical things, which is why I think it's so great that supplements, elixirs, and gummies are available, and packed with nourishing ingredients that work from the inside out. "Personally, I always found it really hard to remember to take certain things at first when incorporating them into my diet, but one of the things that stuck out to me first with a brand like Olly was the way the packaging looked: bright, colorful, compact. I'd leave them in my kitchen and I'd see Undeniable Beauty and Vibrant Skin vitamins on the counter right when I woke up. If I was running out the door, I'd remember to throw them in my purse or pack them in my suitcase. Like with anything, consistency is key, and Olly just made it easier to be consistent." What's your vitamin of choice? Please sound off in the comments!